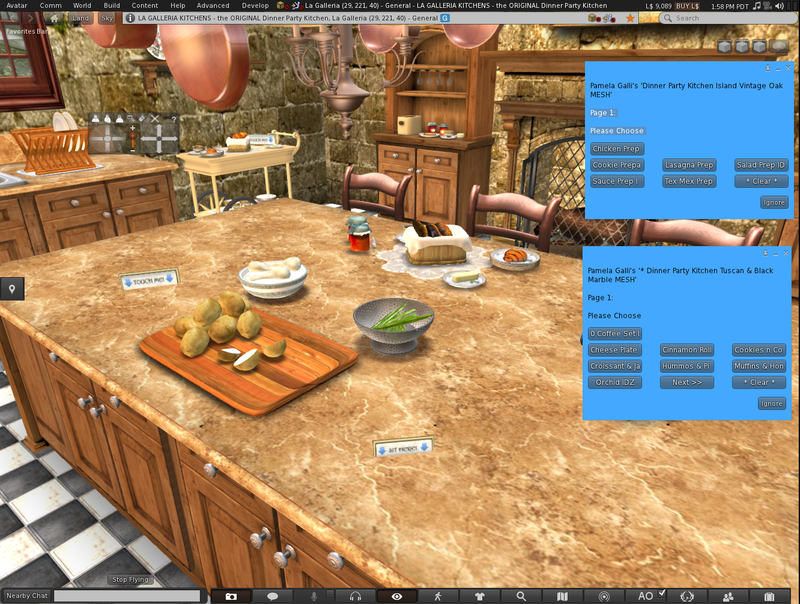 When any food set is rezzed, you will receive a reminder in chat of the instructions given here. 1. L Click the center of the island on the side nearest the cabinet doors to choose from a menu different things to prepare. 2. Follow the instructions given in chat: If there is a spoon in a bowl in front of you*, L Click the spoon. You will see a menu asking if the spoon may attach. Say YES, and it will attach to your hand. If there is no spoon, choose the Lower Left knife in the knife holder, and say YES to attach. 3. R Click and “Sit” on the Left Corner of the island nearest doors to choose an animation — either stir or chop. 4. When done, Click the Detach button in the top left corner. Click STAND in your viewer to stop the animation. 4. To lean against the island and chat with the cook, R Click and “sit” on the right corner of the island nearest doors . * You may instead use the spoon or whisk in the utensil holder if you like.